These delicious Easy Mini Chocolate Donut Spiders are going to knock the socks off of your little party-goers for Halloween! I don’t know about you, but when it comes to Halloween treats, I want quick and easy! The kids, however, want to take something fun and “cool” to school for their Halloween party. So how do we compromise? 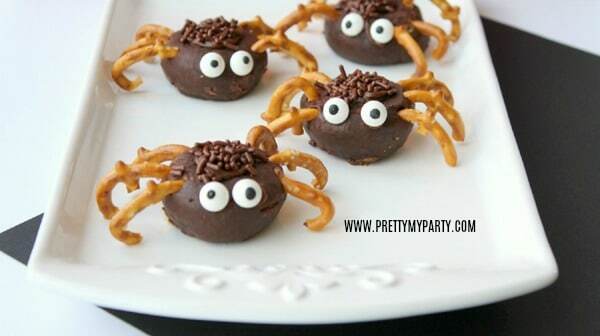 With these Easy Mini Chocolate Donut Spiders, of course!!! The kids will absolutely love them and they will be super excited to take them to school for a fun treat! I don’t know about you, but my kids don’t get donuts too often, so this is an extra special treat for them! 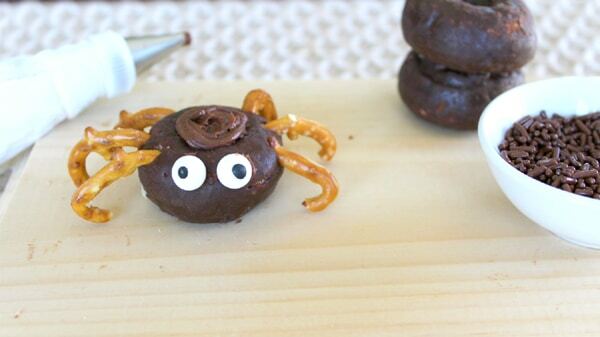 You’ll be surprised how easy it is to create a simple Spider Donut. Just look at the picture below. See those ingredients in the different bowls? That’s all you need! It doesn’t get much easier than that. This is a great recipe to make with the kiddos, too, since it’s an easy one for little fingers to help prepare. That’s a win-win in my book! How cute are these ingredients?! I’m excited just looking at it! I love those candy eyes. It’s going to look super cute when it’s complete! Because let’s face it … candy eyes always equals an adorable, edible treat! First, break all of the pretzel twists to a good length for spider legs. This is going to be the trickiest part, so be careful! It may be best to have this done by an adult. As good as your children are at meaning well, they may end up crushing those poor spider legs and soon, you’ll have your cute Mini Spider Donuts looking a little lopsided! If you want to make this a little easier, you could also use straight pretzels that stick straight out of the “body”. If you go this route, use 6 pretzel sticks, 3 for each side, and place them into the donut as the legs. Just remember, the bigger the donut, the easier you’ll have placing all of the pretzel legs into the places where they belong! 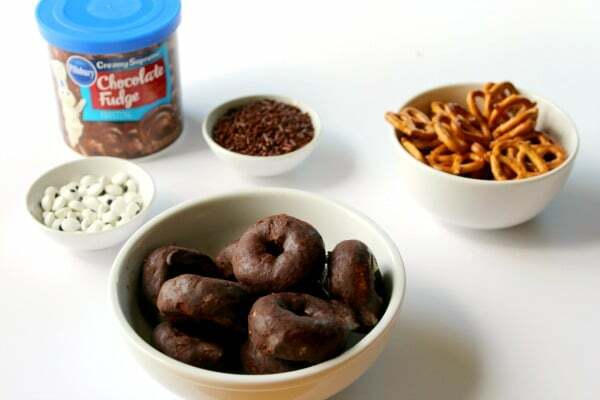 Just look at these chocolate pretzel spiders coming together already in the picture below! We’re sure the kids are ready to dig in right away, but there are still extra steps to go! And don’t stress when you inevitably break some of the pretzel legs. It may take you a bit to get the hang of where they need to be broken off at, but once you have it down, you’ll be unstoppable! Fill in the donut hole by adding chocolate frosting to the top of the spider and sprinkle with chocolate sprinkles. This will hide that donut hole and is a cute way to make it look like the spider has a little “hair” growing on it! The kids are great at helping out with this part. Get one to do the chocolate frosting and another to add the sprinkles and take turns doing each! Don’t have a fancy frosting tip to use? No worries. You can just take a little dollop of chocolate frosting with a spoon and you’re good to go! We are keeping these Easy Halloween Spider Treats simple and accessible for you to create! 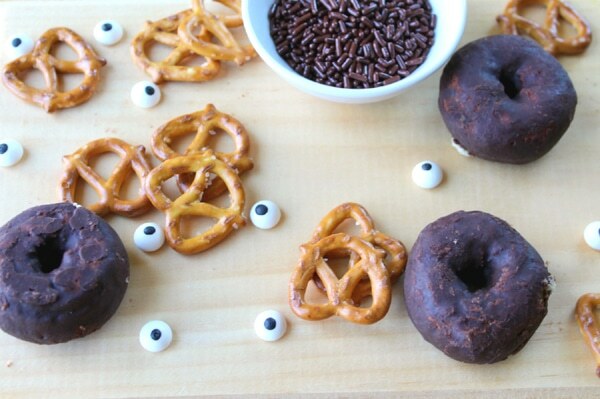 By simply using a small dab of chocolate frosting to where you want the eyes to be, attach the edible eyes to create the final look of your donut spider! Make sure you use enough chocolate frosting so the eyes will stick well. Don’t be afraid of it, since the chocolate frosting won’t show up well on the chocolate donut, anyways! 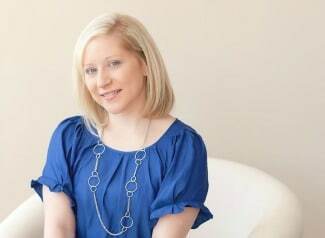 Straighten out the eyes as much as you need to, in order to make them even. That’s it! Can you believe that you’re done already? 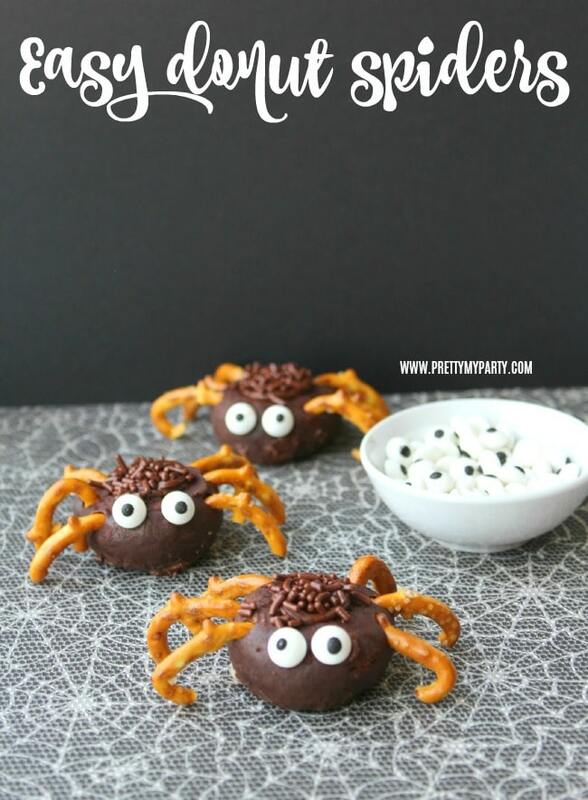 Just look at these adorable Halloween Pretzel Spiders! Can you believe that this was only a 3-step recipe that you can make? Now you see why these are the perfect Halloween classroom treats. 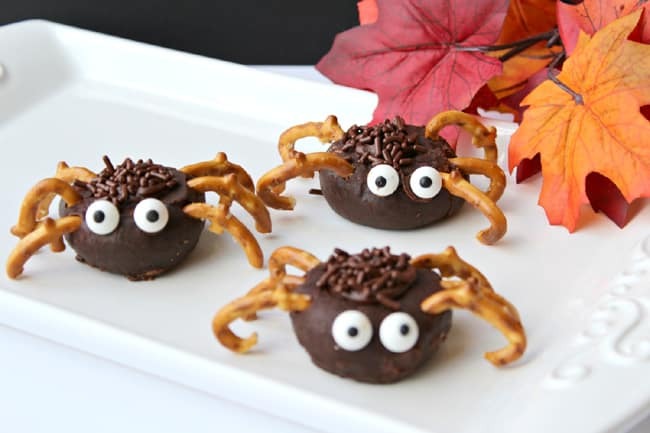 They are so easy to make and with the help of those little hands, you’ll have a classroom’s worth of these Easy Mini Chocolate Spider Donuts all ready to go in no time! You could even mix things up by using white powdered donuts, as well. We generally keep things dark, black and creepy over the Halloween season to add to the scary factor, but these sweet little guys would look great, either way! 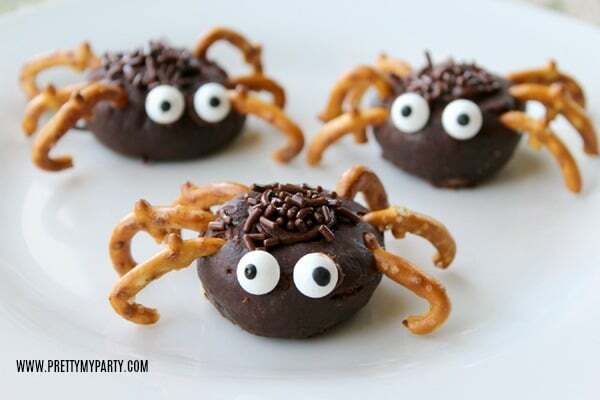 These Easy Mini Chocolate Spider Donuts are SO much fun to make! And the fact that it takes you less than 2 minutes to create each one is a great added bonus! There aren’t many treats that you can say that about! 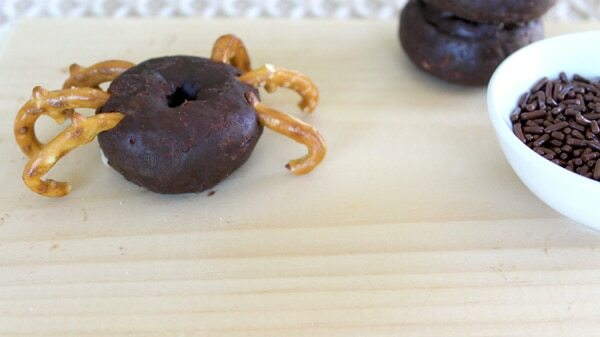 While finding some chocolate covered donuts shouldn’t be a problem, this spider donut recipe would also work with chocolate donut holes, as well. They might be a little more “round” instead of oval, but the kids won’t mind! And there you have it! These Easy Halloween Spider Treats will hit the spot at your own Halloween party, as a quick, fun after school snack for the kiddos, or for the school treat that they will want to take for their Halloween party. And since they are so easy to create, it will be no problem to knock out a quick 20 for the classroom, so don’t sweat it! You got this! They are the best creepy little treats around! 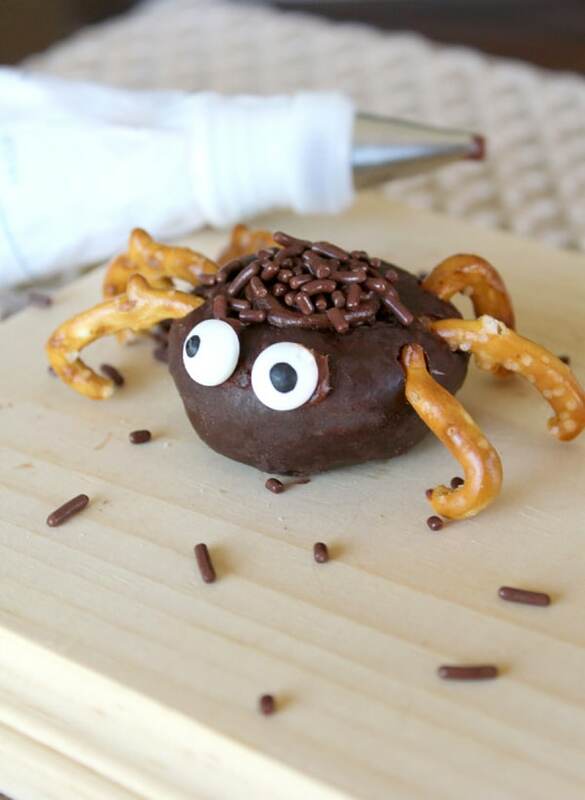 These Mini Donut Spiders are quick and easy to make for Halloween. The kids will absolutely love them and you can even have them take them to school for a fun treat! Break Pretzel twists to a good length for a spider leg; this is the trickiest part and probably should be done by an adult. You could also use straight pretzels that stick straight out. Use 6 pretzel sticks and place into the donut as the legs. 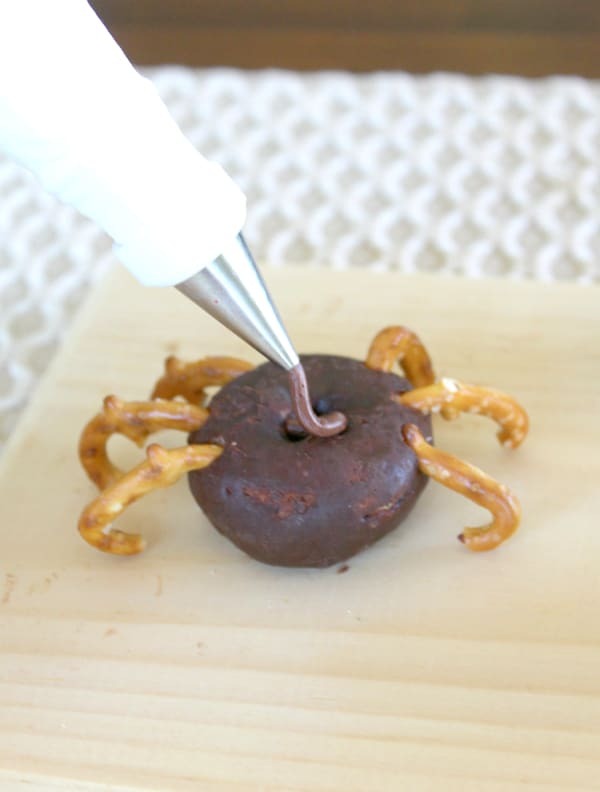 Fill in the donut hole by adding chocolate frosting to the top of the spider and sprinkle with chocolate sprinkles. This is such a fun treat to make and we love how easy it is. Halloween treats don’t have to be overwhelming and time-consuming to create. Just follow this simple recipe and you’ll have a great Mini Spider Donut Snack For Kids all throughout the Halloween season! They are the most adorable (and creepy) little spiders we’ve ever seen! So cute! My kids will love to make these!